I'm getting ready to head back to Iqaluit this weekend. This time I'll be there for about 5 weeks. It's a little less stressful than last time because I feel like I have a decent idea of what to expect. The other big difference this time is that Julia will get to come up for a visit while I am up there! The hospital in Iqaluit graciously arranged for her to come up for a site visit! I'm excited to show her around the hospital and the town, and her visit will make spending 5 weeks apart much easier! Maybe she'll even write a blog entry when she comes up? Yesterday was the kind of day that makes tourists in Vancouver move to Vancouver. 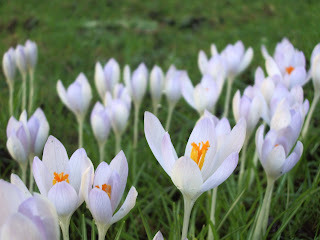 It was February, it was spring, it was warm and sunny and the flowers were in bloom. It was the kind of day that makes you happy just to experience it. 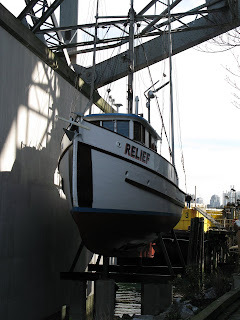 Here are a couple of pictures I tool of the city while walking around Granville Island. Finally, here are a few links to other blogs that I found interesting. 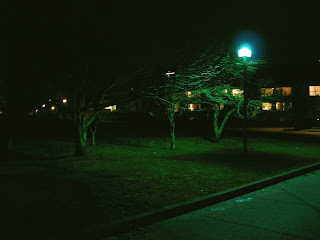 Here is a blog written (well, dictated) by a 107 year old lady from Australia. Here is an arctic based blog I enjoy. 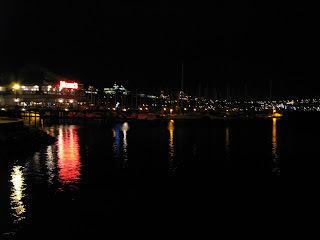 And here is Ulises travel blog that I have ported from another site over to blogger for him. I am not much of a city person. I prefer to stay in my own neighbourhood and shop as locally as i can. When I have time off I prefer walking in the woods to shopping downtown. 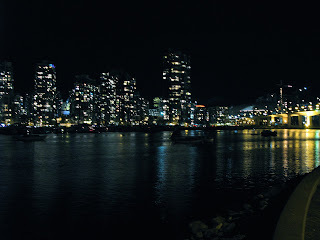 That being said, there is something beautiful about a city all lit up at night, and of any city I have been in, Vancouver is probably the prettiest. 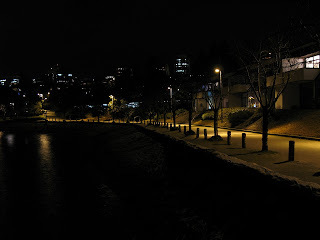 Here are some pics from my walk along False Creek tonight. What a view! Certain objects are infused with a feeling or an emotion. It may be because of what an object represents, where it was found, or what it brings to mind, but for some reason certain objects tend to trigger memories. Here are 2 objects that always make me feel calm, if for but a moment in a hectic day. This is a painting by Leo. 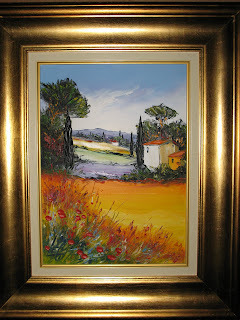 Julia and I purchased it from the artist when we were in France on our honeymoon. When I see it out of the corner of me eye, for a moment, I am there again. A bonsai tree doesn't do anything quickly. This tree always makes me slow down to watch it grow for a few minutes. Julia and I both enjoy medical history, and we have a few old medical books. They are really neat to read, and by current standards have some ideas that can only be described as odd. 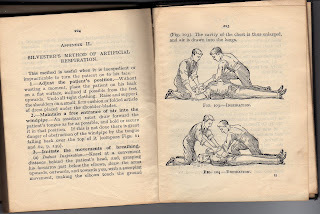 The following is taken from a book called First Aid to the Injured, published in 1928. The book belonged to Julia's grandmother who was a nurse. The picture demonstrates how to do artificial respiration. Don't try this at home. Seriously, don't try this at home, it won't work. After weeks of considering buying a new camera, I finally took the plunge. The Canon Powershot G7 will give me some of the flexibility of a digital SLR without committing me to buying multiple lenses and equipment. It's also small enough to carry around, but takes great pictures! It's a 10 megapixel camera, so I'll apologize in advance for the increased picture size on the blog. I joined another site called Facebook today. Facebook is a social networking website based around user generated content and connections. I am not too sure what being a Facebook member will do for me, but I joined anyways. My brother-in-law Jonathan is doing a Masters degree around how people interact socially on computer networks, it's very interesting stuff. Based on talking with him, I now believe the reason I don't fully understand Facebook is because I'm old! Anyways, old or not, if you have a Facebook account link to my Facebook profile! Why is there an 'urgent need of doctors'? Buried deep in the back section of most medical journals are the classified ads. For many doctors, myself included, these ads provide an interesting read, a gauge of the marketplace for physicians, and a source of comparative data about our salaries. When I started medical training (not that long ago) I was always interested to read over the ads, thinking about where there was a need for physicians, and what that meant about my future practice. Since those days the classifieds section has become thicker, colour advertisements, and more colourful descriptions of the jobs offered have appeared. The language of the ads themselves has changed, and in some cases become desperate. Physicians are not just needed, they are 'urgently needed'. No longer are the requests for 'mutually convenient times', coverage is requested 'as soon as possible'. 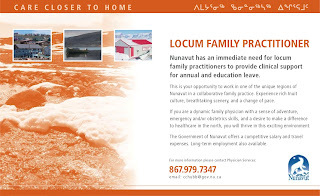 In addition to the traditional advertisements in medical journals, jobs are now advertised in newspapers and an increasing number of online agencies dedicated to serving the physician workforce (www.locums.ca, www.ihirephysicians.com). It's clear that the need for physicians is growing, and that some communities are becoming desperate. It's probably fair to say that there is a shortage of physicians in Canada, although that shortage may have limits that are both geographic and based on specialty. What is not so clear is how, as a country, Canada ended up in this situation, and what is and should be done about it. Fort McMurray, Alberta is the latest community to fall into crisis. Faced with a critical shortage of doctors, this week they have taken out newspaper advertisments detailing the financial package available to doctors willing to provide coverage at their local hospital. Their offer is generous, but as much as I (and many other doctors) would like to help, it's not that easy. Since I do not currently have an Alberta license (I hold a BC and Nunavut license) I would have to go through the entire licensing process, taking 4 to 6 weeks, and at significant financial cost, before I could provide coverage at their hospital. The cause of the current shortage of physicians is complex, but there are some clear factors and trends that deserve discussion. At present there are simply too few physicians in Canada to meet the current demands of both patients and the system as a whole. The 1999 report of the task force on physician supply in Canada clearly shows a trend towards fewer physicians per-capita over time. The cited causes of this decrease are both physician emigration from Canada, changes in physician work patterns and decreased medical school enrollment. The Barer-Stoddart report of 1991 ( Barer ML, Stoddart GL. Toward integrated medical resource policies for Canada. Report prepared for the Federal/Provincial/Territorial Conference of Deputy Ministers of Health, 1991. ), a policy statement on the management of physician supply in Canada, resulted in a 10% reduction in medical school enrollment in Canada during the 1990's. This report was largely flawed and failed to fully account for changing demographics in Canada, and in the physician population, changing work habits in newly graduated MD's, and changing needs in medical practice. Over the years this reduction was in place it added up to thousands of fewer medical graduates than the country required. Even though medical school enrollment was increased starting in 2000, the effects are slow to be felt. It takes 6 to 9 years from the time medical enrollment is increased for those extra physicians to enter the workforce as family physicians or specialists. Over time the patterns of work that physicians choose to take on has changed. In past, most new MD's would move to a community, open an office and affiliate themselves with a hospital. They would participate in an on call schedule, or might themselves cover call 24/7. They would rarely take vacations and would likely remain in a single community for many years. In the present, new MD's are reluctant to invest in opening their own office, sometimes reluctant to affiliate themselves with a hospital, often reluctant to move to small communities, and almost always unwilling to take on 24/7 call. More than ever before, newly graduating physicians are older, more likely to have family obligations, more likely to be women, more likely to already be geographically tied down, and more in debt (often more than $100,000 in debt). More than ever before newly graduated Canadian physicians are demanding jobs that allow them to spend time with family, and on interests outside of medicine. All of these trends effect the total amount of labour available from the Canadian physician workforce. That is, even if the per-capita physician quantity in Canada remains static over time, there might be fewer available total hours of physician labour available to the system as a whole. Many health care administrators, and even some older physicians, are quick to label younger MD's as lazy because they are prioritizing areas of their lives other than work and following alternative patterns of practice compared to their predecessors. Unfortunately names and blame are largely irrelevant, since neither causes any appreciable changes in physician work behaviour. Much of the debate has focused on changing patterns of physician practice (getting physicians to work more), rather than the more realistic solution of changing physician supply to meet demands based on evolving practice styles. Physician geographic distribution has changed over time, with the physician population as a whole becoming more urban. The fallout from this fact is that rural and remote communities are often the ones with the large, colourful advertisements, and the severe physician shortages. Although the fallout is clearly visible the causes or the trend towards urbanization are less clear. Some of the factors likely at play are, older (more geographically entrenched) MD graduates, the proportion of city dwellers selected into medical school at baseline, the selection of highly specialized/research focused candidates into medical schools, the focus on large urban tertiary care hospitals during medical training, and increasing debt loads. Similar factors have also caused shifts away from primary care and generalist specialties and towards more specialized practice (not just family practice but general internal medicine, general pediatrics and general surgery). Although the causes are difficult to tease apart, the effects are easy to discern. There are fewer physicians to go around in Canada. The physicians we have are not willing to put themselves in positions where they will be overworked or underpaid. More and more often communities and hospitals are putting out 'urgent pleas' for help in 'crisis situations'. As communities get into crisis and shortage, the doctors left work harder and harder, and new doctors avoid moving in because they can see how overstretched the communities resources already are. Health care is consistently one of the top priorities of Canadians. If we are to continue to provide high quality health care to all Canadians, we need to revisit the debate on physician supply. Specifically we need to realistically look at the evolving trends in the physician labour pool and develop strategies to meet demands within that context. We need to continue the regionalization and rural-ization of medical training. We need to make rural and remote medical practice an attractive option, and choose people for medical school who will find this an attractive option. We need to develop strategies that make various models of medical practice attractive (such as national locum licenses, guaranteed vacations, and retirement planning). Until the shortage is addressed, in a sustainable way, the classifieds will get thicker, and the ads more colourful. The Canadian population continues, on average, to age. Physicians are also aging, and many are now approaching retirement age. Planning for Canadian physician labour supply is an important priority in ensuring the ongoing provision of high quality health care for all Canadians. Anyone who believes that all Canadians, regardless of age, or location, should be able to see a doctor when they need to (or to have a family doctor) should be concerned about this issue. One of the nicest things about vancouver is the early spring. 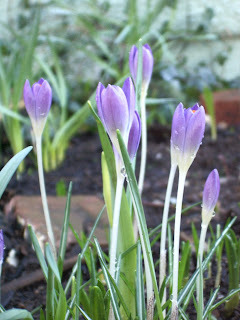 It's Feb. 15 and the flowers have begun to bloom. Spring has begun! Enjoy! Here's a great video I watched today about bush pilots in Alaska. It's produced by national geographic and has some amazing scenery in it. For me it's fascinating how people live on the edge of civilization, and in many ways it seems their lives are happier being devoid of much of the technical extravagance we build into our lives in more urban parts of the world. Part of what draws me to spend time in the north is interest in that simple philosophy of happiness and adventure as part of everyday life that many of the folks in this video seem to have. The video is broken into 7 short parts. I've embedded the first section, and linked the rest below. Enjoy! Well since I have been home I have been a house husband, and not working...and that means that last week I was on a mission to clean up our house. As some of you might know, our house is almost totally lacking in storage space. 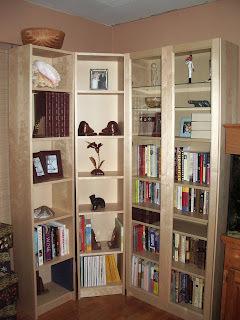 We have a couple of closets, but nowhere to put boxes, or bins, or to really store anything. I figured that a couple of new peices of furniture would help the situation so I headed down to IKEA to purchase a new bookcase and coffee table. Well, I think this should fit. Now how do I tell the difference between the 10831 screw and the 10389 screw? Probably doesn't matter! This is supposed to go where? What do you think those extra peices are for? Well in the end I did finish. 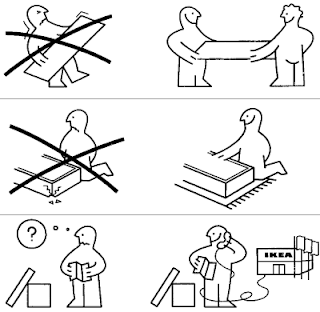 After using the IKEA tools I know how Mats Sundin has a great wrist shot! A childhood of furniture building with tiny tools must have given him great wrist strength. So here's the finished product, and in spite of the building challenges they look great! After a long day of flying; YFB to YVP to YOW to YUL to YVR, I finally landed back in Vancouver. It was a balmy 4 degrees Celsius on landing, and although it did seem warm after the -30 I have been used to for the last month, it was very damp! 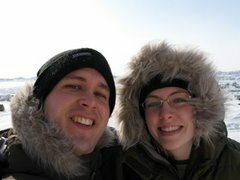 (Iqaluit is very dry in comparison) It was definitely nice to be home and to see Julia! I also brought back some carvings from Iqaluit and Julia really liked the polar bear I bought for her. I always like to buy art directly from the artist because they can tell you about how they made it and it has more meaning. It is amazing how many of the people in Iqaluit and Pangnirtung, and the other Nunavut communities support themselves through art. On any weekend night in the lobby of the Frobisher Inn in Iqaluit you can see dozens of carvings for sale directly from the artists, and for very good prices. It's fun to see the various styles, and talk with the artists about how they make the carvings and what the carvings mean. Most are done from a stone called serpentine, antler, bone or ivory. Here are the carvings I brought home with me. The day after I got home we went to Emily's birthday party which was a lot of fun, and last night Julia took me to a nice welcome home dinner at Bridges Restaurant. Bridges is a nice resturant on Granville Island. I had never been there before and the food was great. I had a shrimp appitizer, monkfish, and a chocolate mousse for dessert. Julia had a pear salad, monkfist, and a creme brulee for dessert. It was a great night out! It's definitely nice to be home again. I am looking forward to going back to Iqaluit in March, and luckily Julia will be able to come up for a visit and to see the town for herself as well! 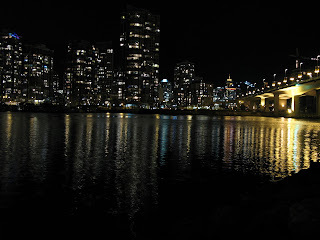 While I am back in Vancouver I'll continue to put up any thoughts, or good pictures I take as they come up.